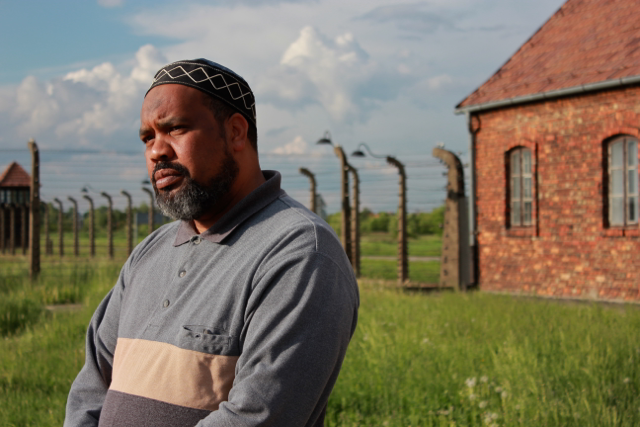 Imam Mohamed Magid, President of the Islamic Society of North America, at Birkenau Death Camp. On May 18 – 24, 2013, a delegation of the world’s most influential Muslim leaders joined organizers Rabbi Jack Bemporad, Executive Director of the New Jersey-based Center for Interreligious Understanding (CIU), Catholic University of America Law Professor Marshall Breger, and Suhail Khan, Senior Fellow, Institute for Global Engagement and former GW Bush liaison to the Muslim community for a second historic journey — from Dachau to Auschwitz – to see for themselves one of the great tragedies of the 20th century. Among the participants were Imams, Sheikhs, Islamic educators and leaders from Saudi Arabia, Jordan, Bosnia, Palestine, Indonesia, Nigeria, Turkey and India; Secretary of State John Kerry’s newly appointed Special Envoy to Monitor and Combat Anti-Semitism, Ira Forman; the State Department’s Principal Deputy Assistant Secretary for Democracy, Human Rights and Labor, Ambassador Michael Kozak; and Rashid Hussain, U.S. Special Envoy to the Organization of the Islamic Cooperation (OIC). The group toured the Jewish Ghetto and made a daylong visit to the infamous Auschwitz-Birkenau camps, met with camp survivors, and were guests at an interfaith dinner with Warsaw’s chief Imams hosted by Rabbi Michael Schudrich, Chief Rabbi of Poland. On May 28th, as a result of visiting the concentration camps, meeting Survivors and Righteous Among Nations (those who tried to save Jews,) and learning the history of “The Final Solution to the Jewish Question,” the Muslim leaders issued an unprecedented statement against Holocaust Denial, condemning anti-Semitism, and pledging to fight the misuse of the Holocaust as a leading propaganda tool to foment anti-Semitism and anti-Western sentiment. This CIU-sponsored trip was funded with grants and support from the Polish Ministry of Foreign Affairs, the U.S. State Department, and supporters of the CIU. Imam Ilyasi, Chief Imam of India, hugs the director of The Jewish Museum of Munich.